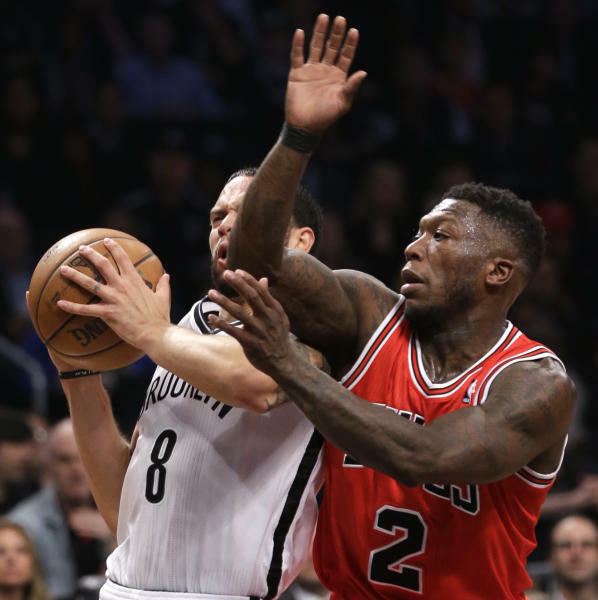 CHICAGO (AP) — The Chicago Bulls had a chance to put away the Brooklyn Nets. Instead, they stumbled. Their first-round series shifts back to Chicago for Game 6 on Thursday, and the Bulls look like a team that could be in trouble even though they lead 3-2. That's because Kirk Hinrich was sidelined by a calf injury. Joakim Noah still seems limited by a foot problem, and instead of putting away the Nets on Monday, the Bulls got tripped up 110-91. If the Bulls are still in the driver's seat, then the Nets at least have a hand on the wheel. "I don't know," Noah said. "Every game is huge in the playoffs. You win, you feel great. Sky high. When you lose, you know you feel like (garbage). So it's on us to not take anything for granted and be ready for a big Game 6 at home." A win on Thursday sends the Bulls to the second round, where LeBron James and the defending champion Miami Heat will be waiting. Otherwise, it's back to Brooklyn for Game 7 on Saturday, a scenario that seemed almost unthinkable just a few days ago. The Nets appeared to be down and out after the Bulls rallied from 14 down in the closing minutes of regulation on the way to a triple-overtime win in Game 4 at the United Center. It was a different outcome in Game 5, though. Brooklyn controlled the boards and outscored Chicago 15-1 at the finish to keep this series going. Brook Lopez dominated with 28 points and 10 rebounds, and Deron Williams scored 23 and contributed 10 assists. "Our back's against the wall right now," Brooklyn's Gerald Wallace said. "We're in a fighting spirit. We're a fighting team. We're not ready to go home. We feel like we're better than this team. We just let some games slip away so we feel like we're good enough and a better team that we can come back and win three games in a row just like they did." Nate Robinson got the start at point guard for Chicago and finished with 20 points and eight assists. But he wasn't able to provide the jolt he gave the Bulls off the bench in the previous game, when he carried them down the stretch. His 34 points on Saturday were the most by a Bulls reserve in a playoff game, and all but five of them came after the third quarter. He shot the Bulls back into the game down the stretch in regulation and hit more big shots in the overtime periods. On Monday, the offense didn't run as smoothly with a shoot-first point guard. Robinson couldn't stop Williams, either. Hinrich could have helped in both areas, but he was wearing a walking boot and had a noticeable limp on Monday after bruising his left calf in Game 4. His status for the remainder of the series is in question. It didn't help, either, that Noah remains hobbled by plantar fasciitis in his right foot that caused him to miss 15 games during the regular season, or that Taj Gibson is still fighting through a knee problem. That helped explain the Bulls getting outrebounded 44-33 and giving up 24 second-chance points. As the series shifts back to Chicago, the Bulls are staggering a bit. "Home court is not going to win it for us," coach Tom Thibodeau said. "We're going to have to play well. So the important thing is, it's good to be home, we have good support there, but we've got to put the work into the game to give our fans something to cheer about. So we can't get it clouded. We have to get things corrected." It remains to be seen what adjustments — if any — the Bulls make. They could give Marco Belinelli more time at the point if Hinrich isn't available. Another option might be giving Richard Hamilton a look at shooting guard. The veteran seems almost like a forgotten man at this point. He's played a grand total of seven minutes in this series after missing a big chunk of the regular season because of injuries. Either way, the Bulls don't want to return to Brooklyn. "It's a must win for us," Robinson said.